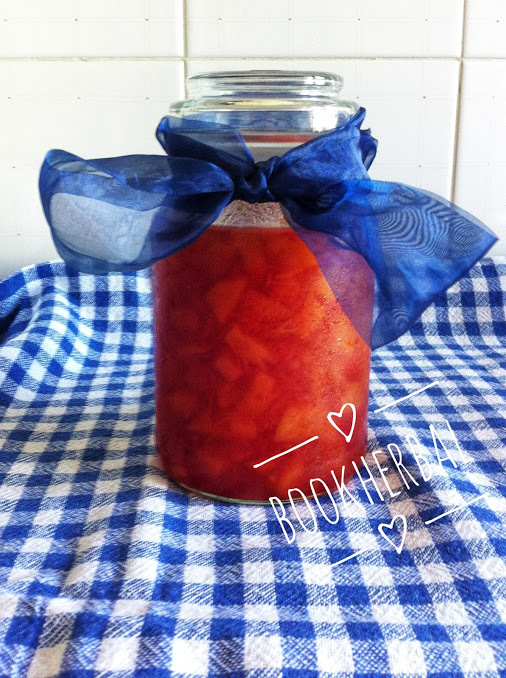 Summer has gone and I'm newly awake to make peach jam.Today I've quick but delicious post for you. 1- Bring boiling-water canner, half full with water, to simmer. Wash jars and screw bands in hot soapy water; rinse with warm water. Pour boiling water over flat lids in saucepan off the heat. Let stand in hot water until ready to use. Drain well before filling. 2- Peel and pit peaches. Finely chop or grind fruit. Measure exactly 4-1/2 cups prepared fruit into 6- or 8-quart saucepot. Stir in lemon juice. 3- Mix 1/4 cup of the sugar (from the measured amount in the bowl) and pectin in small bowl. Add to fruit in saucepot; mix well. Add butter to reduce foaming. Bring mixture to full rolling boil (a boil that doesn't stop bubbling when stirred) on high heat, stirring constantly. Stir in remaining 2-3/4 cups sugar. Return to full rolling boil and boil exactly 1 minute, stirring constantly. Remove from heat. Skim off any foam with wood spoon.